Using custom marker icons is a great way to personalize a map on your website. You can find great custom icons created by Nicolas Mollet in his Maps Icons Collection. We also have free icons available on our website. If you are feeling adventurous, google free google map icons png. When using third-party icons, please remember to credit the developer on your website. There are three ways to use custom markers on your map. To change the icon for all of the markers on your map, see WordPress Dashboard → Maps → Edit → Advanced Settings → Default Marker Image. 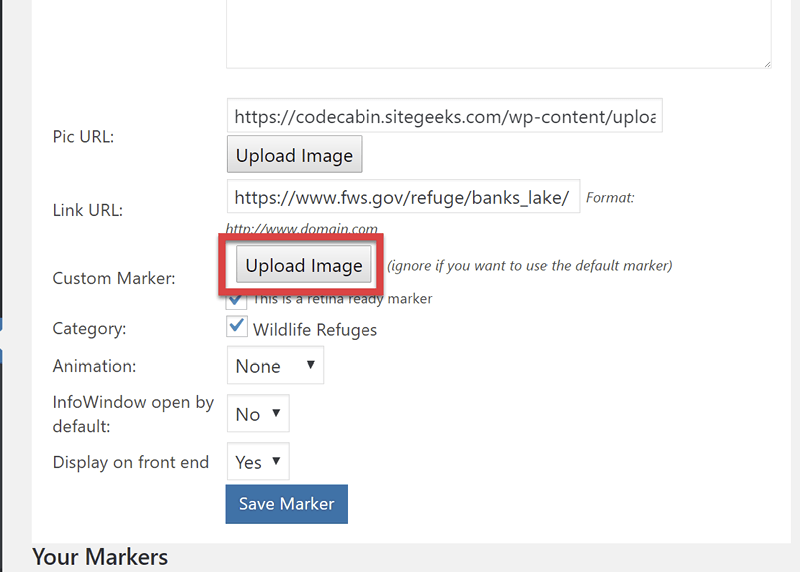 Click on the Upload Image button next to Default Marker Image. Select an icon from your Media Library or click the Upload Files button to upload a file from your computer. When you’ve selected the desired icon, click the Use as Default Marker button. Click on the Upload Image button next to Default User Location Icon. Select an icon from your Media Library or click the Upload Files button to upload a file from your computer. When you’ve selected the desired icon, click the Use as Default Marker button. When you’ve completed all your changes, click the Save Maps button. To change a specific marker icon in your map, click on the Edit button in the Marker Listing as shown in the screenshot below. After you click the Edit button the data for your selected marker will be shown in the Add a Marker panel shown below. To change the Marker icon click the Upload Image button. Select or upload your desired icon and then click the Use as Custom Marker button shown in the screenshot below. After you’ve made all your desired changes to the marker, click the Save Marker button. The last method of using custom marker icons on your map, is to use Marker Categories. Please note that you first need to have created Marker Categories, in order to use this method and apply categories in the Map Editor. To create (or edit) Marker Categories, go to WordPress Dashboard → Maps → Categories. To add a new Marker Category, click the Add New Category button. This will display the Add a Marker Category panel shown below. Give your category a Category Name. 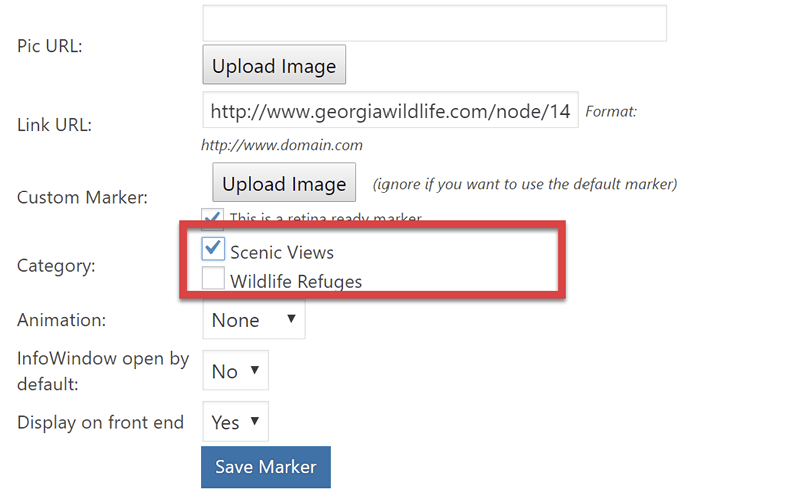 To select a marker icon, you can either enter the icon URL or upload an image to the Media Library using the Upload Image button. Selecting an icon for a Marker Category uses the same interface as the other two methods of using a custom marker icon described earlier in this article. Once you’ve selected an icon to use, click the Use as Default Category Marker button. If your icon is Retina Ready, enable the Retina Ready toggle as shown in the screenshot below. You can assign this icon to All Maps or Specific Maps by enabling the Assigned to toggle switches. When you’ve made all desired changes, click the Save Category button. Once you have created at least one Marker Category, your Marker Categories will be shown on the Markers panel of the Map Edit screen as shown in the screenshot below. Once you’ve selected the Marker Category, click the Save Marker button. This covers using Custom Marker icons. If you need further assistance with this feature or are having other issues with the plugins, feel free to post on our Support Forums or visit our Support Desk.